Crock Pot Mississippi Whole Chicken - Recipes That Crock! This Crock Pot Mississippi Whole Chicken is a variation of a tried and true recipe Cris has been cooking up for a long time! I couldn’t let her have all the fun! Cris has made up Crock Pot Mississippi Pork Roast, Crock Pot Mississippi Beef Roast and Crock Pot Mississippi Chicken Thighs…so when I was trying to think of recipes that were easy to make and could fit in my July $50 Challenge, I knew I wanted to make a whole chicken. Cris generously offered to let me try her “Mississippi” recipe on a whole chicken and boy was it good! While not everyone is comfortable using pre-made packets in their low carb diet, we enjoy Mississippi Whole Chicken in our low carb menu from time to time by substituting the traditional ranch packet for a dill ranch packet or chive and onion packet. Both reduce the carb counts for the entire recipe by 16 carbs. Additionally we make sure to use AuJus Gravy packets instead of higher carb gravy packets– this typically makes the carb count at least 1/4 of what it would be. 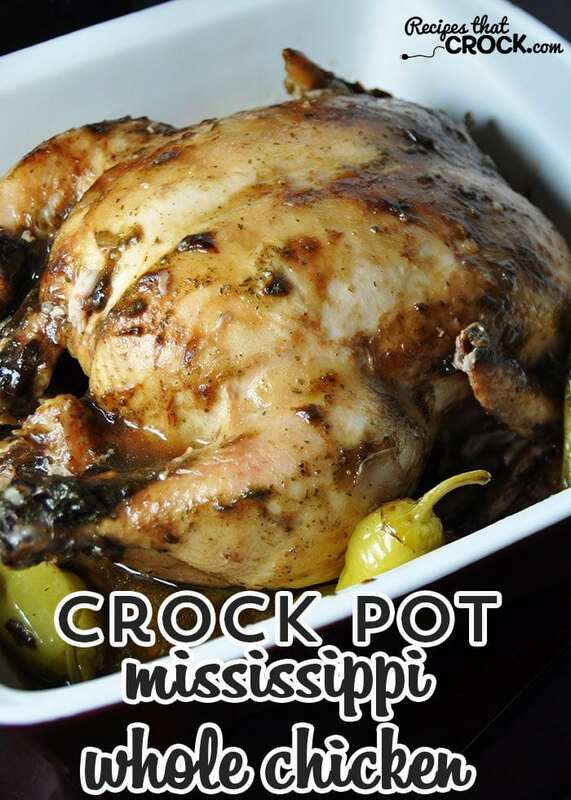 If you need an easy recipe, be it for time reasons or to build your confidence in cooking your skills with your crock pot, this Crock Pot Mississippi Whole Chicken would be a great recipe for you to make! Don’t worry if you aren’t a pepperoncini fan, Cris taught me that you don’t have to eat them, they just really add to the flavor! I used good ol’ Sir Hamilton (my Hamilton Beach Programmable Insulated 6-quart crock pot) for this yummy Crock Pot Mississippi Whole Chicken, and it worked perfectly. I mean, come on, it is Sir Hamilton! He delivers every single time! 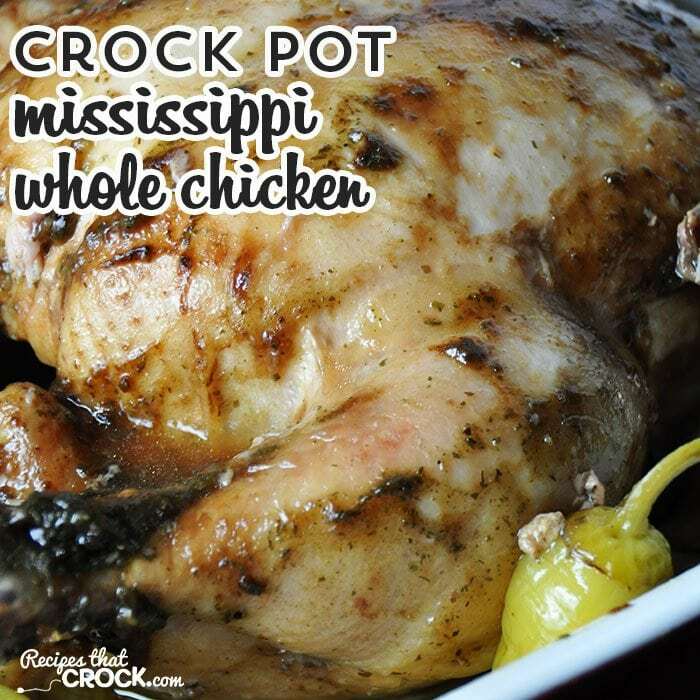 This Crock Pot Mississippi Whole Chicken is so easy to make and a winner every time! Don't worry if you aren't a pepperoncini fan, Cris taught me that you don't have to eat them, they just really add to the flavor! I used good ol' Sir Hamilton (my Hamilton Beach Programmable Insulated 6-quart crock pot) for this yummy Crock Pot Mississippi Whole Chicken, and it worked perfectly. I mean, come on, it is Sir Hamilton! He delivers every single time! Have been waiting for a week for leftovers to be gone so I could try this recipe. Will be making it for dinner tonight! Wanter to use the Au Jus but local store didn’t carry it. Will post results after we try it. Well I said I would rate this recipe after I made it so here I am again. I made this recipe a few days ago and it was a huge success! Instead of using the whole chicken I ended up using 4 extra large thighs since we had a lot of them in the freezer. And since I didn’t have any pepperoncinis I ended up using these super sized hot peppers that are made by a family owned company from my hometown back in WV. I’m so glad I brought a part of back home with me when I moved here to GA. Anyway, part of the way through cooking, my roommate decided we needed more peppers in it so I wasn’t about to argue being that I love hot peppers. As I added the rest of the peppers from the jar he also suggested that I add the liquid the peppers were packed in. Since I’m an experimental cook I thought why not. By the time the meal was cooked it ended up being the best chicken either of us has ever had! This recipe is well worth trying and don’t be afraid to experiment with any extra add on ingredients you may come up with. You may just end up like us and come out with one of the best meals you might ever make! I’ve made the Mississippi beef roast and loved it…can’t wait to try this one! OMG, I’m wondering if I should be adding water to the crock pot (yes, I’m just that dense) … it’s cooking in the crock pot now! SOMEONE PLEASE HELP ME OUT !!! The cooking liquid does not need to cover your chicken. Between the butter and juices from the chicken, there is enough liquid. Make sure you leave the lid on so you don’t let out your heat or moisture. Enjoy! I can’t wait to try this recipe. Thanks. I’ve been doing my own version of this for years. I like to skin the chicken and then rub with olive oil and season. I cut up a couple onionsand put a few chunks inside and rest outside. Then take a whole jar pepperoncinis (Greek if I have) and put some I side and rest on top and around I just add a little chicken stock and let it cook slow all day. The house smells divine and the chicken is awesome with the best flavor. Great to do with a bunch check of breasts also and shred up for renewal!. Anxious to try this version. Thank you for all of the wonderful recipes. I love that it is real food made from regular things I keep on hand.